Mass Effect 3 has only been available for about two weeks now but apparently players have already spent around 1,800 years (you trying doing the maths on that one) in the multiplayer mode. 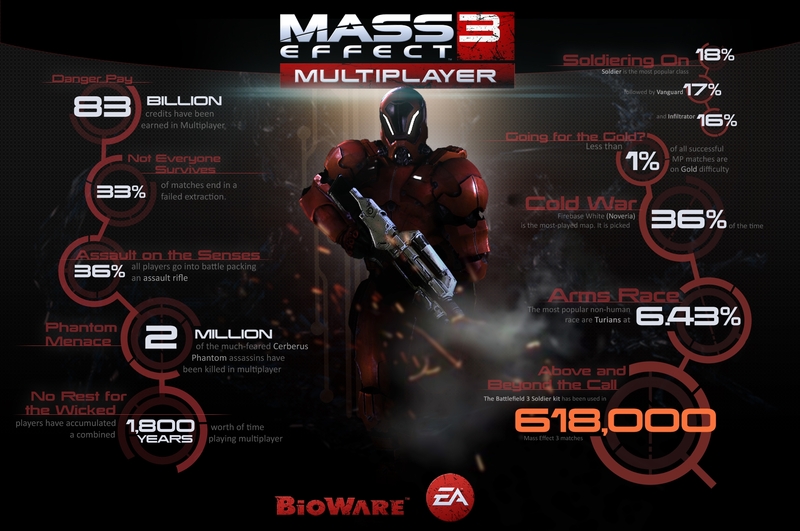 I havent yet played either Mass Effect 3 single player mode or multiplayer mode but some of the statistics on offer are intriguing. I have no idea what the multiplayer modes are like. Are they co-op, competitive or both? Anyway according to the stats “83 billion credits have been earned in multiplayer”, “The Battlefield Soldier kit has been used in 618,000 Mass Effect 3 matches” (I have no clue what that involves) and “2 million of the much-feared Cerberus Phantom assassins been killed in multiplayer”. Stats are always interesting. Mass Effect 3 Demo is Available. Mass Effect 3 Demo Available on Valentines Day.